This article contains all merchandise created by the Buffalo Wizards in regards to URealms Live. You can find the official Urealms shop here. The Blunder Bros Shirt is a premium t-shirt created by artist LoveDittleDoll and features the characters Gracias and Philhipé wearing letterman jackets with a double 'B' designed on the back with a large explosion. It is in reference to the term coined by Coestar during Band of Thieves when he wished for Gracias and Philhipé to use their Blunderbusses during combat. The Curse of K4 Shirt is a canvas ringspun v-neck that features a flaming D20 that has rolled a 4, which has now changed to a K4. This references the superstition of 4s appearing more frequently in campaigns due to the character K-4 not being respected during Band of Thieves. The shirt is available in red or black. The NO TRICKS Shirt is either a canvas ringspun v-neck or a premium tee shirt that features three Pot Puppies in front of flames and above white letters that spell out "NO TRICKS." This is a reference to the Pot Puppies that appeared during The Jewel of the Dingo Isles campaign, who, unbeknownst to the Players, are immune to fire. The theme to the Dingo Isles campaign was "No Tricks." 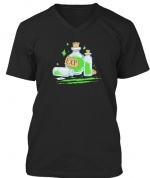 The Rank Eleven Paladin shirt is either a canvas ringspun v-neck or an american apparel women's fitted tee that features Roamin's signature golden Ankh that has now became synonymous with Paladins in the URealms world. The women's fitted tee comes in red, black and pink while the standard canvas ringspun comes only in red. This shirt was sold during The Zarlin Catacombs campaign. 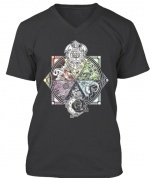 The Tower of Ultimate Wizardry shirt is either a bella+canvas unisex premium jersey v-neck or a Hanes tagless tee. 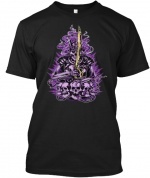 The shirt depicts the art work used during the interlude between floors of The Tower of Ultimate Wizardry: Chapter One campaign and was as the campaign was released on YouTube. The shirts are available in dark blue, black or purple. The mug was available in only the dark blue variation. The URealms Live, Yes? Shirt is a premium tee shirt, canvas ringspun v-neck or a women's relaxed v-neck that features a Hat Rat speaking traditional Abracadab, "Yes?" This is a reference to The Unseen Rogues campaign which first features the Hat Rats and the Abracadab language. It was available in grey and in pink. The URealms Live - AHEM Shirt is a premium tee shirt, canvas ringspun v-neck or a women's relaxed v-neck that features a Rick Snot using his ahem power from The New Crew campaign. It was available in dark blue, dark grey, and light grey. The Urealms Live - E.X.P. campaign consisted of a premium tee shirt, canvas ringspun v-neck, women's relaxed v-neck, or mug that features bottles of E.X.P. from the Battle of the Bards and Okagnoma Guild Hall campaigns. This shirt was sold during The Cobblers campaign. It was available in dark grey. The Urealms Live - Dragon Aspects campaign consisted of a unisex premium jersey V-neck, Hanes tagless tee, or mug that featured the Dragon Aspects Mural from a donation event in Unexpected Discovery. This shirt was sold during Unexpected Discovery campaign. It was available in dark grey. The Urealms Live - Hopen For Bopen campaign consisted of a unisex premium jersey V-neck, Hanes tagless tee, or Gildan heavy blend hoodie that featured Bopen from The Skeleton King. This shirt was sold during The Skeleton King campaign. It was available in black and purple. The Urealms Live - The Tax campaign consisted of a unisex premium jersey V-neck, Hanes tagless tee, or Gildan heavy blend hoodie that featured the Taylor Langstom from Woodcarvers. This shirt was sold during Woodcarvers campaign. It was available in black and light blue. The Urealms Live - Den Of Devils campaign consisted of a unisex premium jersey V-neck, Hanes tagless tee, or Gildan heavy blend hoodie that featured the Dragon from Den of Devils. This shirt was sold during Den of Devils campaign. It was available in black and red. Features the symbol of Bei Mei Xhir't as it appeared in Azveltara Z. Features Maelstrom as he appeared in The Sandbolds. Features Galen Sunsword as he appeared in Galen Sunsword: Private Investigator. Features Quintara Lotus as she appeared in The Last Beenu. 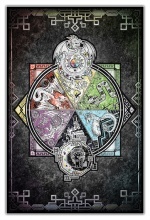 The URealms - Dragon Aspects Poster campaign consisted of a poster that featured the Dragon Aspects Mural from a donation event in Unexpected Discovery. 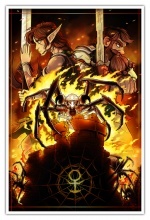 The URealms - URealms - Grand Paladin Order Poster campaign consisted of a poster that featured the final battle of the Grand Paladin Order featuring Gwyneth Sunsword, Lance Willakers, and the massive Venomburner!. Features the players Roamin, Justin, Coestar, and DeadBones being attacked by ageless mermaids, as shown in The Senate of Deadlantis. This page was last modified on 30 September 2018, at 12:58.